'We blew it' • After social media posts claim the ads are in poor taste, Ken Garff group apologizes. Courtesy | Matt Michela, KUTV Ken Garff said it is removing a billboard advertisement that has been seen as anti-police and sparked outrage on social media. Courtesy | Matt Michela, KUTV Ken Garff said it is removing a billboard advertisement that has been seen as anti-police and sparked outrage on social media. 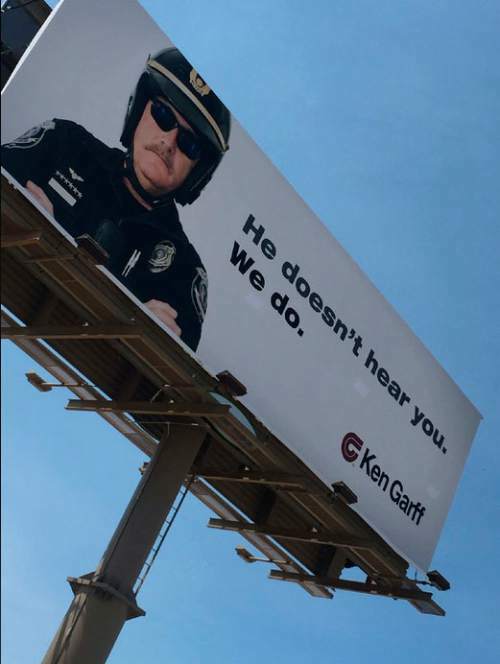 Ken Garff Automotive Group got an earful after it put up billboards along Interstate 15 in Utah that some viewed as anti-police. And the uproar from social media was so loud that the company  whose slogan is "We hear you"  apologized and started taking down the billboards on Sunday. 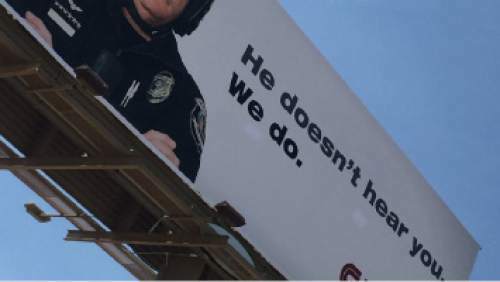 The billboards showed a uniformed officer next to the words, "He doesn&apos;t hear you. We do." The response appeared to be mostly negative. "Unbelievable! Why is it ok to make a billboard like this Ken Garff Automotive Group?" Police Wives of Utah, a nonprofit based in Clearfield, asked on Twitter on Sunday. The group used the hashtag #carslivesmattermorethancops. A poster on Facebook said she was "so beyond disgusted at the choice of marketing you selected for your billboard" and added, "How dare you take business from the men and women you so callously mock?? Shame on you!" On Sunday, the Ken Garff group promised to take down the billboards and apologized in several Facebook posts. "At Ken Garff we are grateful for all of the hard work of our law enforcement," one post said. "We seriously regret our messaging and apologize for making light of their service. We blew it." In another post, the automotive group also apologized to the officer, saying, "While the picture of the officer was used with his permission, it doesn&apos;t excuse the mistake we made." Becca DeHart, president of Police Wives of Utah, told The Salt Lake Tribune the officer on the billboard thought his photo was going to be used in a tactical gear magazine. "We are very pleased that they took responsibility," DeHart said. "The marketing scheme that they did was in very poor taste." DeHart said three or four of the billboards had been put up. Two of them, near Point of the Mountain and American Fork, had gone up over the weekend, according to KUTV. Not everyone who commented on the billboards was upset. "It&apos;s just a billboard! Dang!" one post said. "But I&apos;ve never claimed to be a member of the ultra-easily-super-offended-about-everything group that&apos;s prevalent in society today."